As long as I’m on a smoothie roll (last week being a luscious turmeric smoothie), this week I’d like to share my basic green smoothie recipe. Simple and nutritious. I especially like this one as it consists of ingredients that are staples in my fridge. Romaine: loaded with protein, calcium, Omega 3’s, iron, and B vitamins. Celery: rich with Vitamin A, helps reduce bad cholesterol, has magnesium which helps soothe the nervous system. Cucumber: numerous antioxidants and B vitamins. Parsley: Vitamin K which helps improve bone health. Apples: boosts the immune system and helps detoxify the liver. Pears: fiber, Vitamin C, potassium. Lemons: rich in Vitamin C. Also helps detoxify the liver. Chia seeds: packed with fiber, calcium, magnesium and phosphorus. If you’ve never used chia seeds before, be warned: they “gel” the drink very quickly. I don’t like the texture at all, so when I add chia seeds I do it just before drinking the smoothie — having some floss nearby isn’t a bad idea either. Chia seeds are amazingly good for the body and I often add them to my juices and smoothies. This is my favourite green smoothie ~ tasty and nutritious for very little cost and effort. I hope you are inspired to try it! 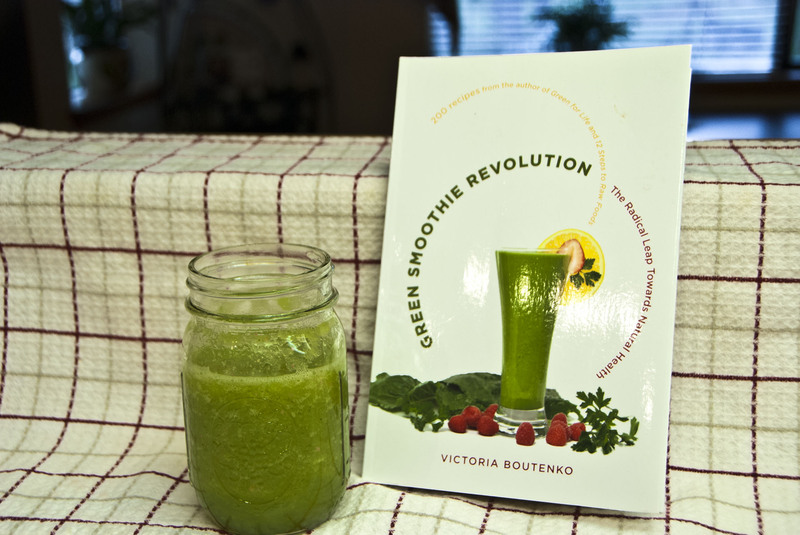 I also highly recommend Green Smoothie Revolution by Victoria Boutenko if you are interested in expanding your horizons in the land of green smoothies.